Representatives from 14 countries meet up to the next day 26 in the 68th edition of one of the most recognized and oldest fishing tournaments in the world. Domingo Cisneros, among other directors of the aforementioned entities who joined competitors, representatives of the National Institute of Sports and Physical Recreation, boat owners, members of the Cuban Federation of Fisheries Sports and specialized press. Domingo Cisneros said that fishermen come from nations such as the United States, Puerto Rico, Canada, South Korea, Spain, Latvia, Colombia, Portugal, Mexico, Italy, Bulgaria, Chile and Cuba. He stressed that this year, the closing date coincides with the first tournament in 1950. “To celebrate this happy event we have an exhibition of personal items by the famous writer facilitated by the Ernest Hemingway House Museum, a faithful curator of these articles”, ad. The director stressed that the fishing days will last until Saturday 26, and expressed confidence that they will be unforgettable days of competition in which visitors can enjoy all the splendor of the Cuban coast and its charms. Finally, he reiterated the welcome and wished the participants a happy day. During the opening of the tournament they were recognized by their presence the American team Avimar – champion of the last edition-; the French team with the greatest tradition of participation in the event; and the first team made up of women, also from the United States. As part of the tournament, joint actions are carried out to promote nautical and cultural tourism by making known in a special way the offer of the internationally known Cabaret Tropicana. It also shows the renovation of the bar service to the yacht “El Dorado” of Marina Hemingway. 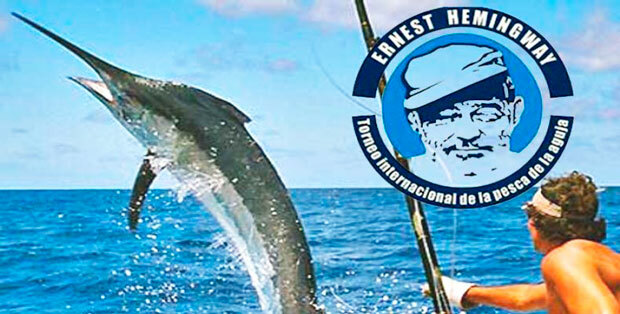 As usual, the Ernest Hemingway International Needle Fishing Tournament is governed by the IGFA rules by the “Tag an Release” method. The thickness of the fishing line will be up to 36 kg (80 pounds). The jury, made up of representatives of the Cuban Sport Fishing Federation, will award first, second and third places with medals for each competitor and a trophy for each team. Likewise, it will recognize the first catch of each fishing day; the greatest dorado, tunido, and wahoo; to the woman that the first needle and the youngest fisherman.